A few years back under the Neighborhood Street Fund process the City of Seattle conducts, community members from the Mercer PTA submitted a project, that was later approved and funded, to replace the current design of 15th & Columbian (shown to the right). The goal of the new design was to improve pedestrian safety, in particular for students and visitors to Mercer Middle School. What does this redesign, do? The redesign reroutes through-traffic on 15th by creating a more standard “T” intersection by extending sidewalk and open space. The reconfiguration would simplify the intersection, reduce how far people have to walk in the street to cross via new curb bulbs, and create a new crosswalk on the southern side of S Columbian Way. Currently there is only a single crosswalk over Columbian Way, off a small pedestrian island. To create this simplified intersection SDOT has indicated that it would remove the signal on S Oregon St and also close the through lane. The rational given for this decision was retaining the signal would cause too much delay for vehicle traffic. Why is the signal at S Oregon a big deal? Many people who live in the neighborhood west of 15th between Spokane and Lucile utilize the signal at S Oregon St to leave, particularly if they’re going left/north. 15th is very busy and it can be difficult to find a large enough gap to turn; in addition finding those gaps may require people to drive aggressively and it feels unsafe. The signal at Oregon allows a protected turn out into traffic, in a manner that feels safe. SDOT has proposed a new signal at S Dakota St & 15th, about 0.25 miles (2 long blocks) north from Oregon. This will provide people in the neighborhood the benefits of a signaled intersection for easier left turns onto 15th and will enhance the Mercer circulation plan by making it safer and easier for school buses to depart. 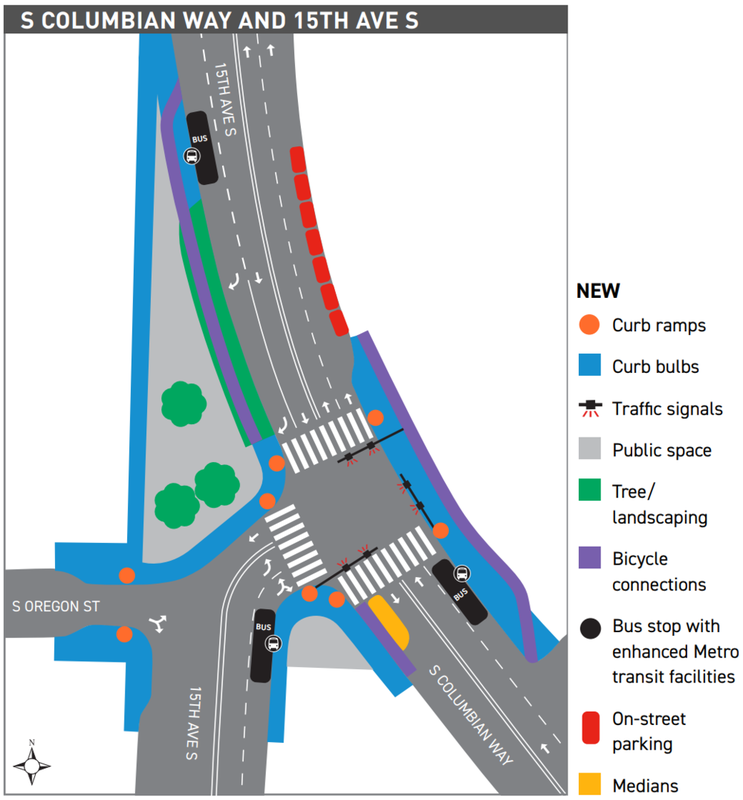 One downside to this compromise is that it will add some vehicular traffic on the Beacon Hill Greenway and possibly create a slightly higher risk of “left hooks” at S Dakota.